We’ve all heard the warning cries: automation will disrupt entire industries and put millions of people out of jobs. In fact, up to 45 percent of existing jobs can be automated using current technology. There is no doubt that technological trends will have a powerful impact on global education, both by improving the overall learning experience and by increasing global access to education. Massive open online courses (MOOCs), chatbot tutors, and AI-powered lesson plans are just a few examples of the digital transformation in global education. 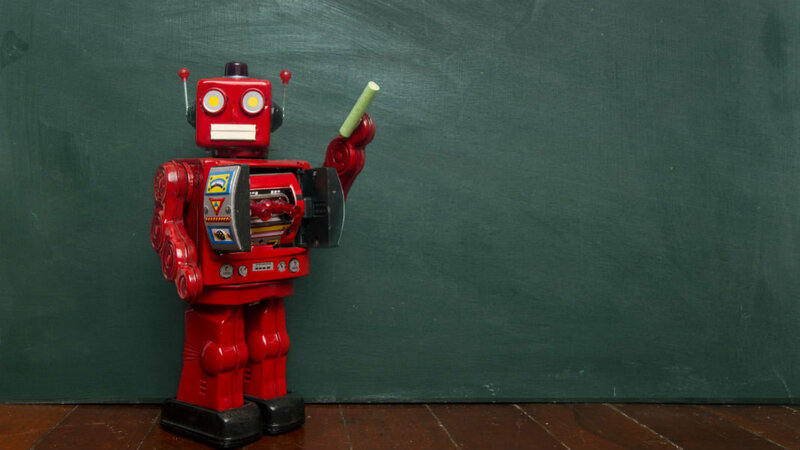 But will robots and artificial intelligence ever fully replace teachers? While various tasks revolving around education—like administrative tasks or facilities maintenance—are open to automation, teaching itself is not. Effective education involves more than just transfer of information from a teacher to a student. Good teaching requires complex social interactions and adaptation to the individual student’s learning needs. An effective teacher is not just responsive to each student’s strengths and weaknesses, but is also empathetic towards the student’s state of mind. It’s about maximizing human potential. Furthermore, students don’t just rely on effective teachers to teach them the course material, but also as a source of life guidance and career mentorship. Deep and meaningful human interaction is crucial and is something that is very difficult, if not impossible, to automate. Automating teaching is an example of a task that would require artificial general intelligence (as opposed to narrow or specific intelligence). In other words, this is the kind of task that would require an AI that understands natural human language, can be empathetic towards emotions, plan, strategize and make impactful decisions under unpredictable circumstances. This would be the kind of machine that can do anything a human can do, and it doesn’t exist—at least, not yet. Let’s not forget how quickly AI is evolving. Just because it’s difficult to fully automate teaching, it doesn’t mean the world’s leading AI experts aren’t trying. Meet Jill Watson, the teaching assistant from Georgia Institute of Technology. Watson isn’t your average TA. She’s an IBM-powered artificial intelligence that is being implemented in universities around the world. Watson is able to answer students’ questions with 97 percent certainty. Technologies like this also have applications in grading and providing feedback. Some AI algorithms are being trained and refined to perform automatic essay scoring. One project has achieved a 0.945 correlation with human graders. All of this will have a remarkable impact on online education as we know it and dramatically increase online student retention rates. Any student with a smartphone can access a wealth of information and free courses from universities around the world. MOOCs have allowed valuable courses to become available to millions of students. But at the moment, not all participants can receive customized feedback for their work. Currently, this is limited by manpower, but in the future that may not be the case. What chatbots like Jill Watson allow is the opportunity for hundreds of thousands, if not millions, of students to have their work reviewed and all their questions answered at a minimal cost. AI algorithms also have a significant role to play in personalization of education. Every student is unique and has a different set of strengths and weaknesses. Data analysis can be used to improve individual student results, assess each student’s strengths and weaknesses, and create mass-customized programs. Algorithms can analyze student data and consequently make flexible programs that adapt to the learner based on real-time feedback. According to the McKinsey Global Institute, all of this data in education could unlock between $900 billion and $1.2 trillion in global economic value. It’s important to recognize that technological automation alone won’t fix the many issues in our global education system today. Dominated by outdated curricula, standardized tests, and an emphasis on short-term knowledge, many experts are calling for a transformation of how we teach. It is not enough to simply automate the process. We can have a completely digital learning experience that continues to focus on outdated skills and fails to prepare students for the future. In other words, we must not only be innovative with our automation capabilities, but also with educational content, strategy, and policies. Are we equipping students with the most important survival skills? Are we inspiring young minds to create a better future? Are we meeting the unique learning needs of each and every student? There’s no point automating and digitizing a system that is already flawed. We need to ensure the system that is being digitized is itself being transformed for the better.